Bob and Mary McCann planted their first strawberry crop in 1982, in rural Woodstock, on land bordering the North Branch of the Kishwaukee River. McCann Berry Farm has 3 acres blueberries for pick your own customers. While not certified organic, we use an Integrated Pest Management Approach to control crop pests, and use as little pesticides as possible. 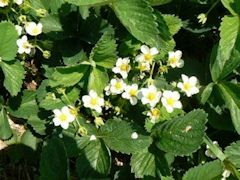 Our berry plants are selected for their disease and pest resistance, as well as, their taste. We monitor the crop for pests and use controls only when pest populations reach a level of potential crop destruction. ©2014-2019 McCann Berry Farm - Woodstock, Illinois - All Rights Reserved.